Which of these is the best new restaurant in Fort Worth? You decide. 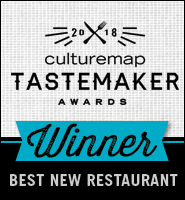 Welcome to the Tastemaker Awards 2018 Best New Restaurant tournament, powered by Whole Foods Market. To cast your votes, hit the start voting button, and the tournament begins. Choose a favorite in each match-up, and proceed until the end or your votes will not count. At the conclusion of each round, the winning restaurants advance, and the voting starts anew. Take note: We are keeping a close eye on the tallies to identify and remove any suspicious activity, so the tournament remains fun and fair for everyone. Vote daily, then join us at the Tastemaker Awards party in Dallas on Thursday, April 19 to celebrate the winner. Please enter your email address to start voting. Yes, sign me up for CultureMap emails.